Get Defined Rock Hard Abs Now! It doesn't take a lot to get a set of abs that are both rock-strong and athletically functional. Six months of ab-specific exercises will easily do it. But, if you ever want chicks to see them, you'll have to follow some focused strategies. * #1 is that you must change your diet to produce a weekly calorie deficit. * When you burn more calories than you take in, you will burn ab fat. * Another challenge will be losing size. 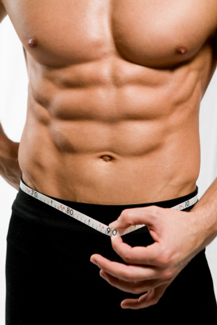 When some guys start dropping body fat and getting more lean, they start to panic. * Searching endlessly for the best ab workouts for men is useless. Your workouts must be progressive and ever-changing. * You get defined abs from a combination of good food choices and structured workouts. * Forget about overloading your workouts with ab-centered exercises, focus on fundamental, strength-building movements that increase lean muscle mass. These will increase your metabolism naturally. What's the truth behind the 300 Spartan Workout?